The Summer Movie Season as we know it died on November 7, 2013. That was the fateful day on which it was announced that Star Wars Episode VII: The Phantom Click-Bait was being delayed from May 2015 to December 2015, making J.J. Abrams’ sequel the first mainline installment not to open during Hollywood’s most lucrative stretch on the calendar. Effectively, the release plan heralded the end of the frenzied blockbuster crunch that George Lucas’ original space saga helped carve out and define. For a time, Summer Movie Season was a perennial shift in the Earth’s polarity, as much of a cosmic mandate as any other part of our collective trip around the sun. Recent events, however, strongly suggest (and almost conclusively prove) that there’s as little room for debate about climate change in our movie theaters as there is for that in our environment. The parameters of the Summer Movie Season have persistently been challenged over the course of the past decade. Studios and audiences alike seem to agree that the dog days of August must remain a transitional period of some kind, but every year has seen a high-octane release moving the goalpost at the start of the season further away from the one at the end of it. Summer Movie Season traditionally began on the first weekend of May, so when Fast Five was released on April 29, 2011, pundits sensitive to such things reacted like the move was a game-changing affront to the sacred code of Hollywood profiteering. The film opened to more than $86 million in its first weekend, paving the way for the April release of Oblivion in 2013, Captain America: The Winter Soldier in 2014, and—most telling of all—2013’s successful 3-D re-release of Jurassic Park. It’s probable that the definitive summer blockbuster of the last 25 years was re-released out of season in order to avoid the gauntlet of new releases, but the box-office triumph of Steven Spielberg’s double-dip (it grossed $45.4 million, making it the fifth-highest-grossing film of any kind released that month) confirmed that summer movies no longer need the summer to survive. They can breathe out of water. The fish hasn’t grown lungs; the world has been flooded. But the most significant takeaway from the Jurassic Park re-release isn’t the box-office grosses so much as the films in competition for those grosses. Among the other top-grossing films of April 2013 were Scary Movie 5 (the fifth installment of a franchise conceived as a July 4 tradition), Oblivion (a mega-budget science-fiction Tom Cruise vehicle), and Pain & Gain. (The fact that it’s Michael Bay’s smallest film only slightly diminishes the significance of it being his first project since 1995’s Bad Boys to be released outside of the summer.) In other words, dropping the Jaws of post-Jaws summer movies didn’t ruffle audiences because Jurassic Park 3D wasn’t really all that different from the other movies that were playing in theaters at the time. It’s true that a disproportionate number of the year’s top-grossing films still open between the first weekend of May and the second weekend of August. Roughly six of any given year’s top-grossing films are released during that timeframe, a statistic that has remained consistent for more than two decades. But the movies themselves tell a different story. Filmspotters used to be able to look at a year’s 10 highest-grossing films and immediately distinguish which were summer blockbusters, and which were just overachieving studio products developed under the tent that the bigger titles were propping up. The titles alone were enough for even the most tenuously informed viewer to have a good idea as to what time of year a certain movie had been released. And the reverse was true as well: In the event that a potential patron wasn’t entirely sure what kind of experience something called Con Air might offer, the fact that it was coming out in June would accurately fill in the blanks. Summer movies weren’t just movies that came out during the summer, they were an entirely different breed of cinema, a genre unto themselves. The films released in April weren’t the same kind of films released in May. In 1996, for example, the year’s four highest-grossing films were Independence Day, Twister, Mission: Impossible, and Jerry Maguire. Take a guess which of those movies didn’t hit theaters between May and September? Here’s a hint: It’s not the one about aliens destroying the White House, or the one about flying CGI cows, or the one about the NOC list, whatever the hell that is. It’s the one about a sports agent struggling to reconcile his actions with his values. That obvious demarcation of entertainments wasn’t inherently good or bad, but the eagerness with which studios packed their mega-budget products targeted at the 18-34 demographic into a single sliver of the calendar certainly suggests that they had other fare to fill out the rest of their annual slate. In 2012, the eight highest-grossing films of the year were The Avengers, The Dark Knight Rises, The Hunger Games, Skyfall, The Hobbit: An Unexpected Journey, The Twilight Saga: Breaking Dawn Pt. 2, The Amazing Spider-Man, and Pixar’s Surprise, It’s Actually About Bears. They all kind of sound like summer movies, but those eight films opened on different months between March and December, and only half of them in the traditional May-through-September window. Sparked by a number of factors (the rise of digital technology and the threat it poses to movie theaters, the emergence of foreign box offices, the avalanche of billion-dollar franchise films, etc. ), Hollywood has abandoned the tentpole system in favor of the mega-blockbuster model, with the studios spending so much money on tents that they can’t afford to put anything under them. The conventional wisdom is that you have to spend money to make money, but outside of the horror genre, that maxim seems to have been twisted into, “You have to spend a lot of money to make a lot of money.” It’s how we’ve ended up with sequels that gross $700 million and barely break even, and it’s why the idea of the summer-movie season as we’ve come to know it is fundamentally incompatible with the current film ecosystem. In 2006, 19 films grossed more than $100 million domestically. In 2011, that number rose to 30. In 2012 it was 31. In 2013, it was 35. The role inflation and 3-D surcharges play in those numbers is obvious and utterly irrelevant; the fact of the matter is that there simply aren’t enough weeks between April and August to hold the number of movies that the studios rely upon to pull in that kind of business. The Harry Potter films were interchangeably released during the summer and the fall, rightfully confident that each installment was equally viable in either season. Fast And Furious (that’s the fourth one) wasn’t technically a summer movie, but Fast Five was. You could make a case for star power, but at a genetic level, there isn’t much of a difference between Oz The Great And Powerful (March) and Maleficent (May). Marvel—the tyrannosaur of contemporary popcorn cinema—has taken that seasonally agnostic approach to the next level, reserving its marquee products for May, but releasing the lesser chapters in early November (Thor: The Dark World), early April (Captain America: The Winter Soldier), or whenever else there might be a gap in the schedule. Indeed, for both Marvel and its competitors, it seems that now the most important thing about a release date is reserving it several years in advance. Forget haggling over a weekend in April. Summer Movie Season now runs 10 months a year, with only January and February being off the table. (And if Kevin Hart continues to have his way, even those fallow days might soon be fair game.) Summer Movie Season is now just another marketing angle, the movies chosen for release during that window amounting to the multiplex equivalent of “maximum strength” painkillers. Of all the movies coming out this summer, there is exactly one that simply wouldn’t fit in any other season, one gargantuan über-spectacle so big that it simultaneously demands its own season while also illustrating the horror (financial or otherwise) that might result if it were unloosed into the wilds of spring or fall. 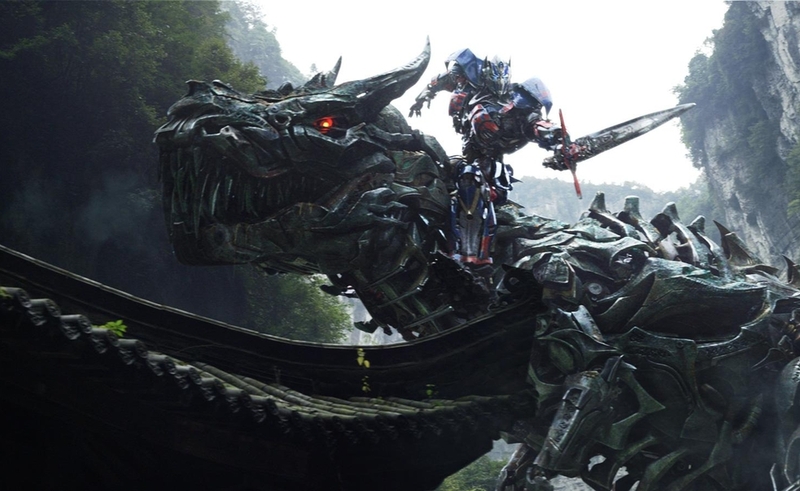 That one movie is Michael Bay’s Transformers: Age Of Extinction, a grotesquely elegiac reminder of what summer-movie season once was, and—if Steven Spielberg is right in thinking that the mega-budget model is inevitably going to collapse under its own weight—why it was needed.